I am relativley new to the biohacking scene and recently ordered my first implantable NFC chip from dangerousthings.com. 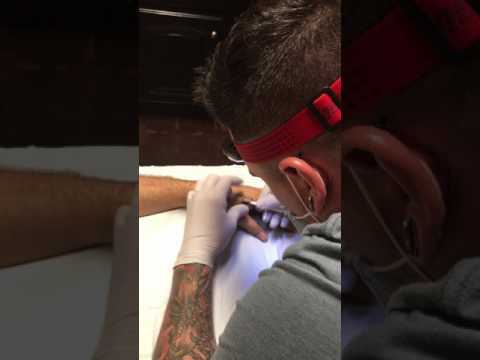 I had a few questions for the veterans out there the first being is it nessecary to have a body artist implant the device or can I do it myself. I have seen people do it on youtube and it does not look that hard assuming I have someone tenting my skin but they all seem to have a significant amount of knowledge when its comes to this stuff. I am not an adult and as such I dont think I can hire a body artist so self implantation may be the only way to go for me unless I abandon the project all together. My second question is if I do go through with the self implantation is some form of numbing agent necessary or will I be okay with just some ice and a rag to bite on. Lasty, if I do self implant, how difficult is it. Any advice would be greatly appreciated, thanks. I got all my implants from a body artists. I've done four self-implants. Two in left hand, one in chest, and a couple days ago, one in my right hand. Doing the hands by yourself is tricky cos you're doing it one-handed. I used a sort of forceps thingy to pinch and lift the skin, hooked onto a shelf on my desk to keep it tented. Just don't pinch too tight or you'll get more bruising from that than you will from the injection lol. I've been using Emla patches to numb the skin on the theory that when I'm DIY implanting, I want to focus on the procedure and not get distracted by any pain. Having said that, the last one I did, the Emla failed so there was no numbing at all. And it wasn't that bad. I don't think the process is too difficult, just think it through, figure out how you're going to do each step in advance (and one-handed if you're doing it in a hand). You don't want to have to scramble for something you forgot, when you're halfway done. One other thing, the first time I was surprised how hard it was getting the big needle all the way in. I was used to much tinier needles, and the 10ga one took a lot of effort to get it in. Like anything, it gets easier the more often you do it. Hey there I have a question about implanting a nfc chip in my hand. I am 15 at the moment and would like to get one when I am 16 (soon) , I am still growing and am not sure when it will stop. Is putting a chip in me possible and will my growth affect it in any way. Also is it something that is possible at my age (I live in the UK). Thx for any help. I've never heard of growth and aging causing a problem, but this is a new area and it's not like there have been big studies of implanting young people. But really a small glass capsule in the hand has so little risk. But research what and how YOU not other people, can use that chip and in what matter, before you implant it just cause it sounds cool.